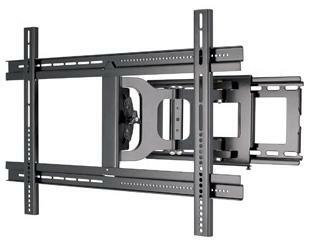 Disclosure: I will receive a tv mount in exchange for this post. Is your family in danger? For many Americans, a flat panel TV is a great way to enjoy family time and entertainment. However, most parents are unaware of the safety risks that flat panel TVs pose for kids. Due to increasing size and new ultra thin designs, today’s flat panel TVs can easily tip over when bumped or pulled, toppling off of furniture and causing injury or even death. ENTER TO WIN a flat panel SANUS TV Vuepoint Mount F180, courtesy of SANUS! Winner will be able to choose the mount that fits their TV. Installation is not included. To enter, just fill in the easy Rafflecopter form below. You must be at least 18 years old and reside in the USA to be eligible to win. Giveaway ends at midnight ET on 7/26/2013. Good luck! outlet covers and i watch them!! Supervision! And putting things out of reach. Get down to baby level and move around the house after you think you have everything secure. Things look different at baby level and you can often find more items that need secured or removed. Even the underside of furniture can be more dangerous than you think, they can have sharp edges on the underside! Water, no matter how shallow, and small, unsupervised children don't mix. My best tip is to keep your eyes on the kids at all times. We use doorknob covers and child safety gate as well to keep them safe! My best child safety tip: Child-proof everything and always over-estimate your child's ability to reach or touch things that might not be safe: scissors, glass items, breakable things. I always made sure to turn handles in while cooking so a child can't grab something hot and/or spill it on themselves. Also for emotional/spiritual safety,.I use parental controls on tv and computer! Secure all the furniture! I try to house-proof my children for times when we visit homes that aren't child-proof. Get on your hands and knees and childproof everything from that point of view. Babygates are a must in our house due to steep steps. make sure that all outlets are covered! Don't forget to secure your garbage containers, little one's are notorious for depositing found things in them. My experience, car keys. Start explaining "WHY" something is not safe early and often, even if you think they are too young. Secure bookshelves! My boys are climbers! Make sure you don't have any sharp corners in the house.